Beijing doesn’t exist anymore. I don’t mean that literally, of course. There’s a city in China named Beijing. It is the capital of the country. It still has a Forbidden City. 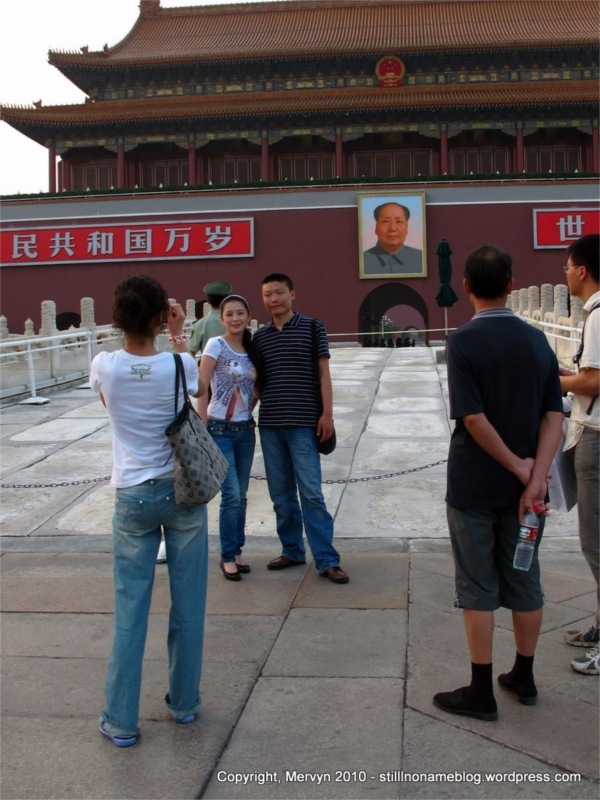 It still has the same giant picture of Mao. It’s still the size of Belgium and it still is home to 15.2 million people. Its citizens will still clear their throats and spit at your feet and will elbow past you like you’re a stalk of wheat. That place is around. No, the Beijing that I’m talking about is the one you have pictured in your head. Or at least, the one in my head. 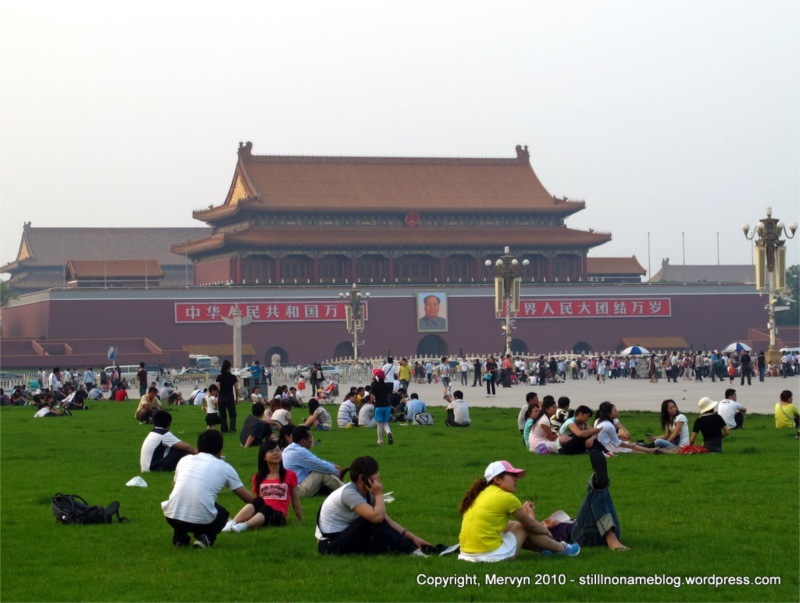 That Beijing had a hustle and bustle of bodies; of millions of people rising in the morning to do Tai Chi under the trees and open their shop doors. Street hawkers selling their wares, calling out to passersby telling you what’s for sale. There was a grit to the place; dust kicked in the air because not every road was paved. The old mixed uneasily with the new. Old world, dilapidated buildings sat next to gleaming modern structures. Millions of bicycles dominated the streets; a few cars here and there would plod their way through the pedaling humanity. If that Beijing ever did exist, it’s long gone now. The streets are paved and six lanes wide in both directions. The old world buildings are gone, replaced by huge skyscrapers, hotels, office buildings, and malls. The blocks aren’t small and intimate, they’re huge and dominated by modern buildings which are set back 150 feet from the street with grass, concrete, and driveways in between them and the road. That separation makes the sidewalk feel impersonal and separate from the places where people work and shop. It’s as if the sidewalk is more part of the road than part of the buildings which they’re meant to connect. You’ll still see an occasional bicycle. Stand by the roadside and after hundreds of cars have passed you’ll find a trailing bike. Most will be electric, silently whizzing along at a decent clip. After a brief silence, a lonely pedal bike or two will trundle past. The giant schools of metal, gears, spokes, and wheels are a thing of the past. In their place are fast moving packs of air conditioned automobiles. I suspect a lot of this change came with the Olympics. China seemed desperate to show that it was a modern superpower. It did its best to clean up the city by paving roads, installing subways, building skyscrapers, hotels, and stadiums. 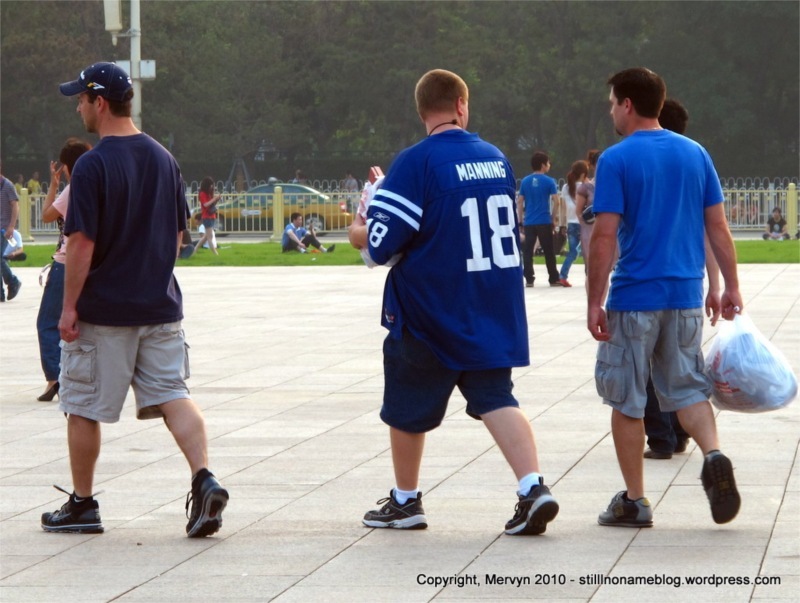 For the games, they taught locals how to interact with Westerners. They shipped nearly all the migrant workers out of the city and back to the villages. In Sanlitun, the ex-pat bar area that I visited last night, they even shut down all the food hawkers. All this to put the awe of God into visitor. I am awfully impressed. Much of the Olympic renovations are still around. Sure, the food hawkers are back in Sanlitun, but the streets are still paved, the hotels and offices still stand, and the subway runs fantastic. It’s quite a feat. So much is gleaming and new. Sadly, I am not charmed. I can’t say I’ve fallen in love with the place just yet. It seems so impersonal. So. . .sterile. (Who would’ve imagined me saying that about anything in China?) I’ve never been to Dubai, but I get the sense Beijing is something like that—an impressive feat, but not the kind of place you have romantic thoughts about. Beijing is like the pretty valedictorian who finished university in two years with straight A’s, plays the piano, cooks well, and makes your mother swoon. 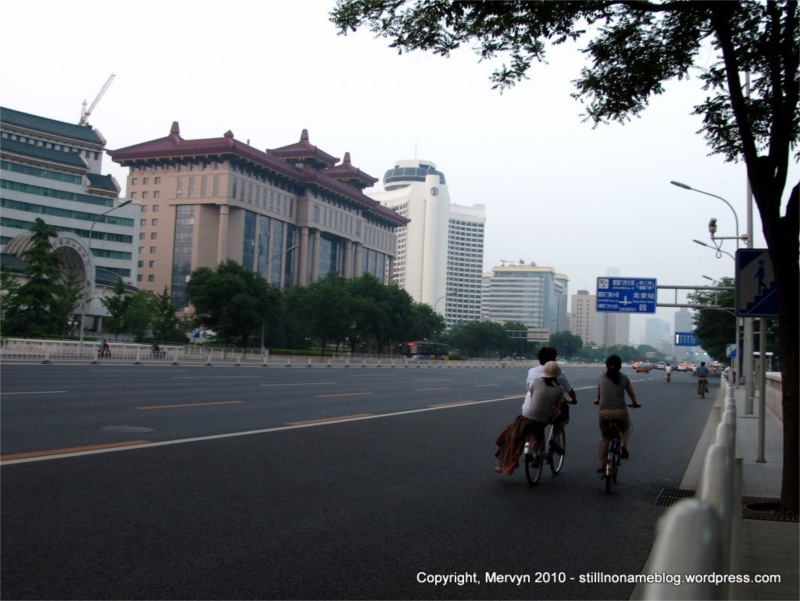 Beijing has accomplished so much in such a short time it’s hard not to be impressed. On paper, it’s everything you’d want out of a growing city. Alas, I prefer my cities a little more like Angelina Jolie than Tracy Flick. Sure, my favorite cities have their smarts and accomplishments, but they’re also a little dirty and rough around the edges. What makes me swoon isn’t their resume and accomplishments, it’s the twinkle in their eye and the mischief in their smile. Hanoi has that for me. So does Saigon. Bangkok has it, but hides the mischief under a more clean-cut veneer (at least until the whole bloodbath thing). Even Phnom Penh had a bit of it, even if most of the time it made you want to let it cry on your shoulder instead of take it home and make out. Beijing, though, is much too earnest. Like Tracy Flick, it’s wants to show you so so badly that it’s succeeding. Its skyscrapers are the gleamingest. Its malls the upscaliest. Its boulevards are the boulevardiest you’ve ever seen. It’s like it read what all the other modern cities were doing and tried to apply all the best changes as quickly as possible. 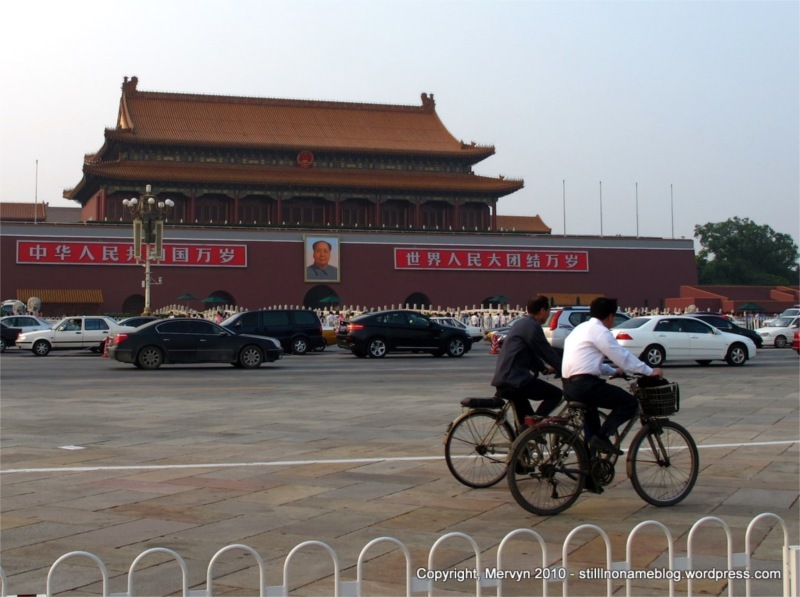 Beijing’s been trying to win for so long I’m not sure it knows how to charm, if it ever did. Again, I’m impressed. 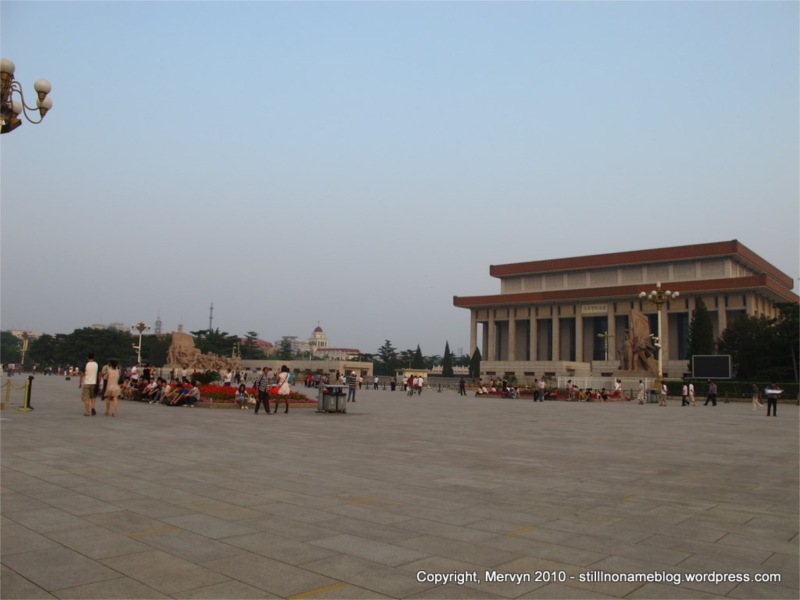 Today, I walked through Tiananmen Square and past the Gate of Heavenly Peace with the giant picture of Mao on it. You can’t help but be awed by the size of the place. It is immense. 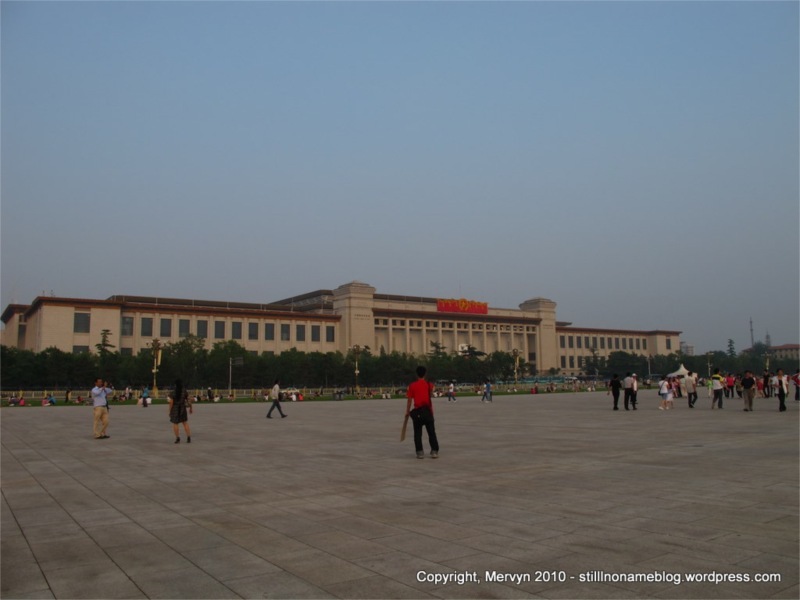 When Mao conceived and built the square, he achieved his goal of conveying the enormity of the communist movement. You can just imagine him reviewing millions of paraders during the Cultural Revolution. 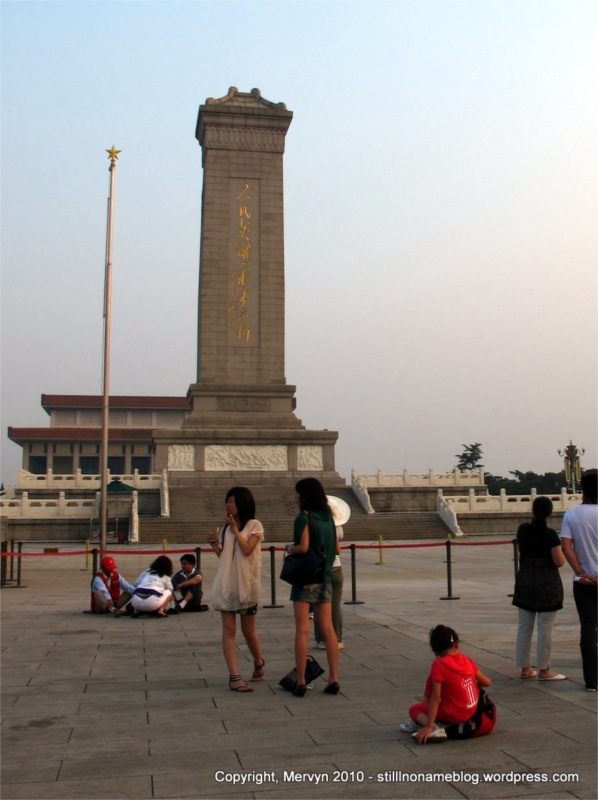 I spent hours wandering around watching out-of-town Chinese tourists pose for pictures, hang out on the lawn, and wait for the guards to conduct a flag lowering ceremony. It struck me, as I walked around, that there were so few Western tourists. Almost all were Chinese (or Chinese looking). 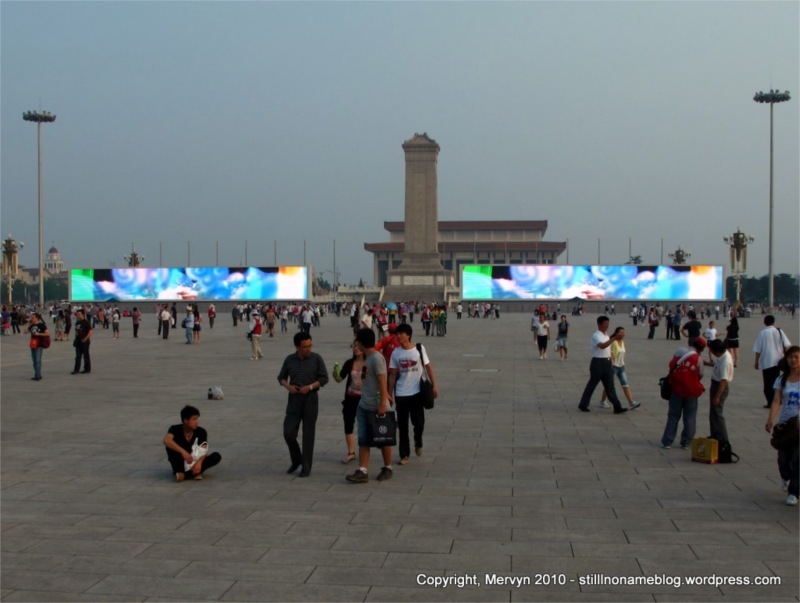 In Tiananmen Square two giant light boards ran through the middle of the expanse and ran a loud video of all the beauty and wonders of China. The earnestness and desire to impress shone brighter than the screen itself. Ironically, it added a bit of unintended kitsch to what might have otherwise been a truly awe inspiring display: the quiet immensity of the empty square itself. And there’s the rub. Beijing is truly a masterwork. It gleams. It’s a feat. It’s a wonder. Especially when you consider so much of this wasn’t here just five years ago. But all that doesn’t make me want to sing love songs or write poetry. It humbles me, but it does not inspire me. It makes me stand back and wonder, but it does not make me swoon. Beijing knows how to impress, but I don’t think it knows how to be intimate–how to whisper in my ear and make me beg for more. Hanoi, Saigon, Bangkok, and even my adopted hometown of San Francisco—they all make me swoon in their own special way. They tug at my heart strings. They make me want to come back. There’s still time, Beijing. Perhaps somewhere, away from the touristy center, there lurks the charming city that I seek. Perhaps it will be a street market or back alley dive restaurant where I’ll find the personable grit. Maybe it’ll be a temple or a park where I’ll find the warmth and the whisper. For now, though, I am impressed. I’m just not in love. RANDOM NOTE: I spent most of the morning writing. By the time I got out it was early afternoon and I was starving. So starving, in fact, that I committed a couple of blunders, including leaving my usb stick stuck in the hostel computer (had to walk back to hostel to retrieve) and leaving the subway one stop earlier than I planned (walked rest of way). I was so hungry I stopped off at McDonald’s for a quick, easy lunch. Guess what I found. The chicken sandwiches at Chinese McDonald’s use only dark meat. That’s right. None of this white, tasteless breast meat crap. Dark, juicy meat was under the crisp, breaded exterior. Apparently, Chinese sensibility has converted the local versions of the world’s largest fast food joint. It’s brilliant. I was totally impressed, perhaps, ahem, even charmed a bit. 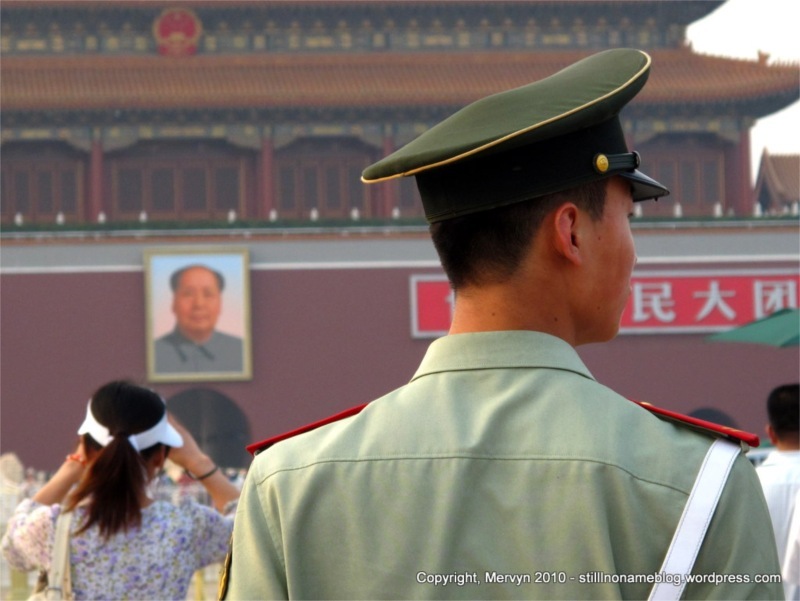 GALLERY: Click through to today’s gallery to see tons more pictures of pictures of Mao, McDonald’s and the magical dark meat chicken sandwich, Mervyn squinting into the camera in front of Mao, guards marching while trailed by marching guard wannabes, and Chinese S.W.A.T. The McDonalds story reminds me of an old co-worker who was from Trinidad, and whenever she went back home her favorite place to eat was KFC. I guess they use a different blend of spices there then they do here in the US. I like it. Next time I’m in Trinidad, I’ll be sure to hit a KFC. I really think you can learn a lot about a culture (or at least a culture’s food) by visiting the local version of American fast food joints. For example, in the Philippines, if you go to McDonalds, you learn that Filipinos prefer their spaghetti sauce a little spicy.